From afar it appears to be a giant blank ice cube with a brown toothpick-like tower oddly sticking out of the top. 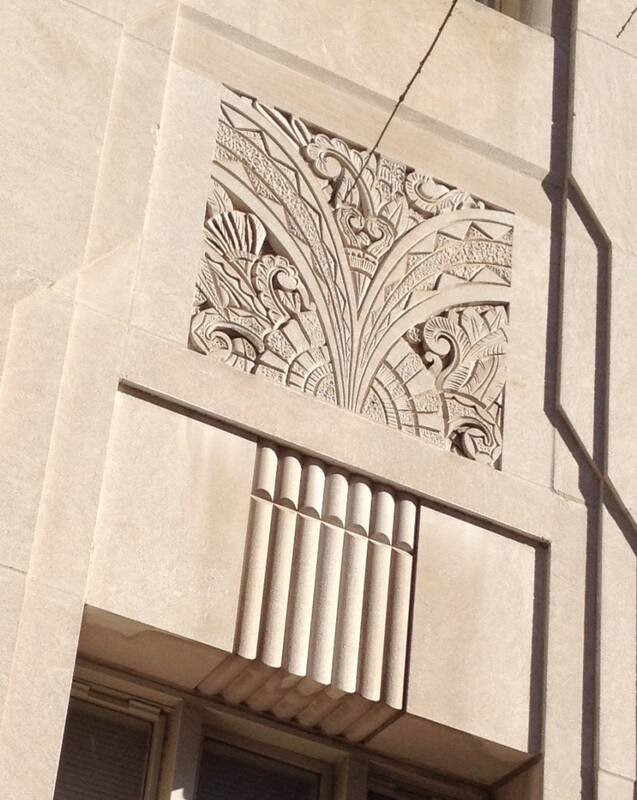 But when you approach the AT&T Communications Building intricate etchings jump out of the limestone in contrast to the modest block form. 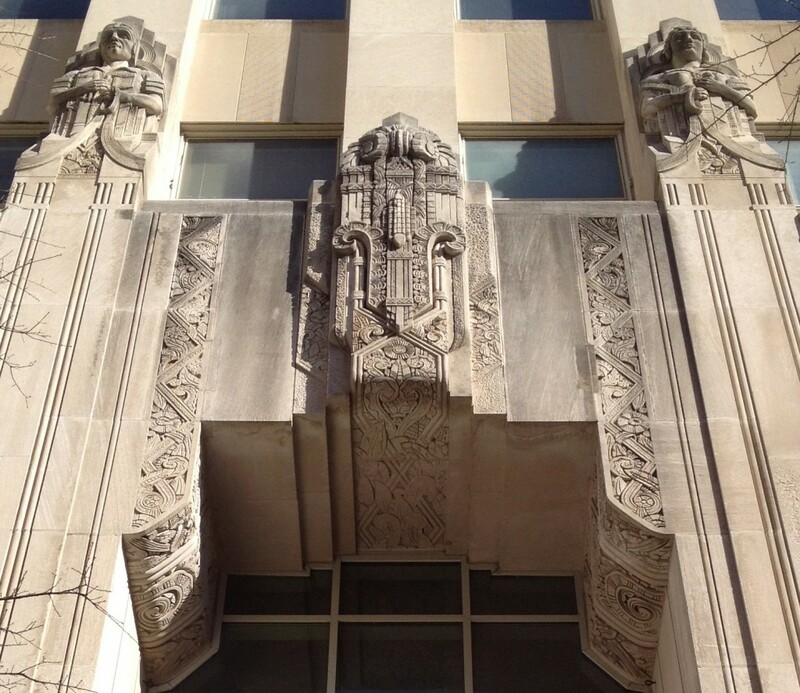 The historic building is a surprising example of the intricate Art Deco skyscrapers built in American cities in the 1920’s, despite the fact that most of this downtown Atlanta building was built after 1946. According to early Atlanta history and folklore, this historic building resides on an interesting plot of land. Hardy Ivy, considered the first white settler of what would become downtown Atlanta, supposedly had a cabin on this piece of land on the northeast corner of Peachtree Center and Auburn Avenue. Early Atlanta rumor says his grave is buried under the parking garage to the west of the AT&T Communications Building, right across Peachtree Center. 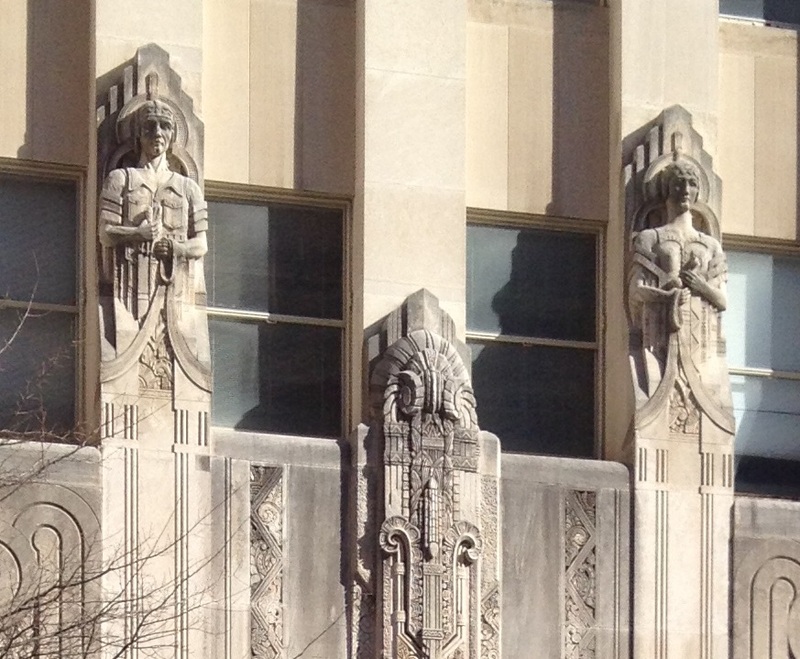 To call it the AT&T Communications Building could be a bit misleading to many older readers. 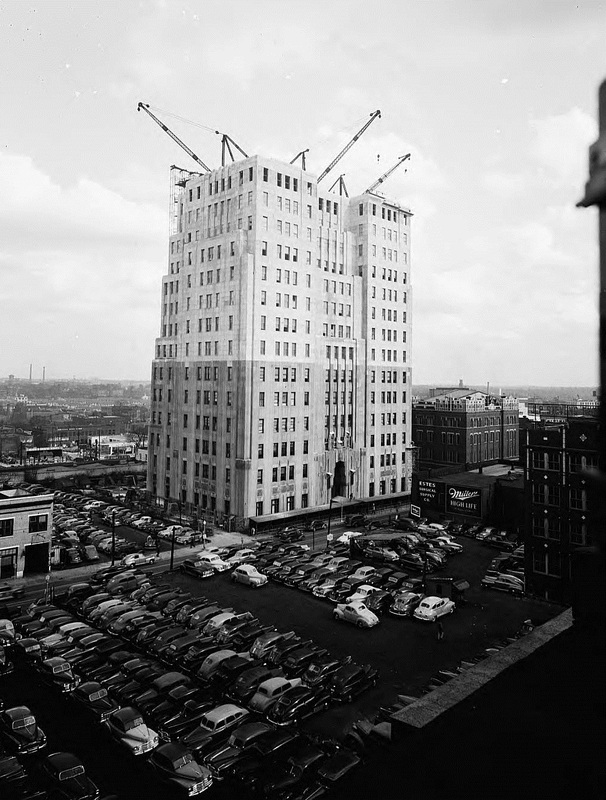 It has held many names over the years, but for most of its history it was known as the Southern Bell Telephone Company Building. And the current height (14 stories, not counting the weird tower on top) is also misleading. 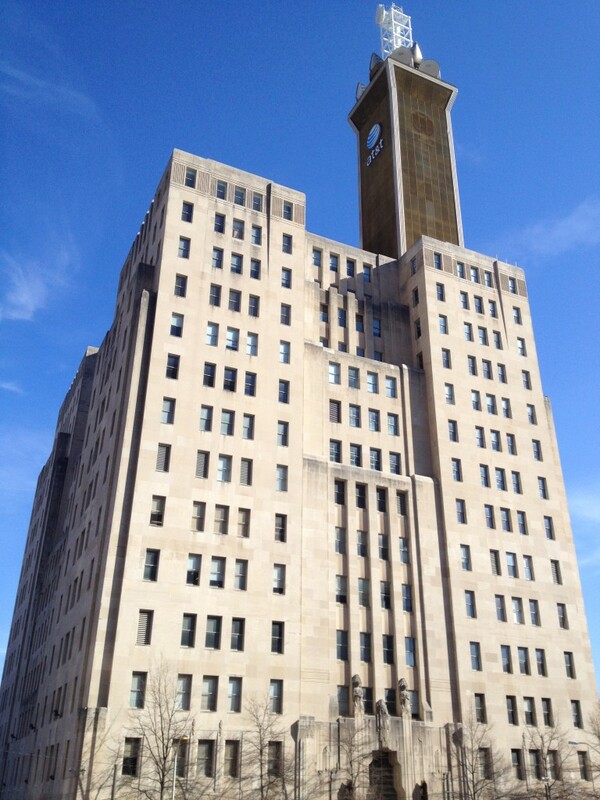 Originally designed to 25 stories in 1928, it was completed in 1929 at the height of only six stories. 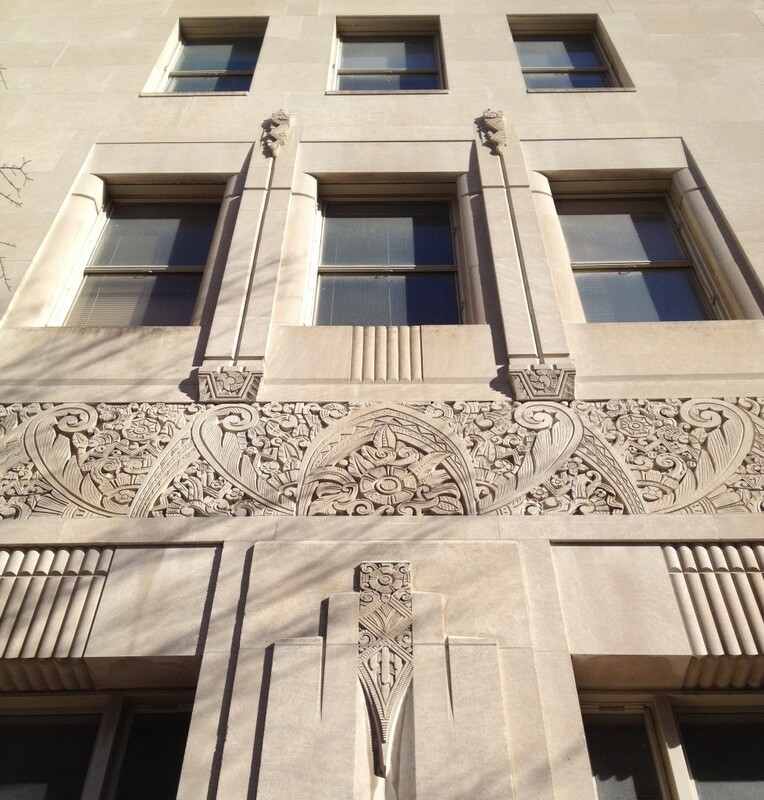 These first six stories, from the windows to the entrance, offer wonderfully carved details such as birds of prey, growing plants, human guards and other organic objects represented in linear, geometric, Native American-inspired forms. It creates a solid artistic Art Deco base for the additional floors that were stacked on top later in this building’s life. 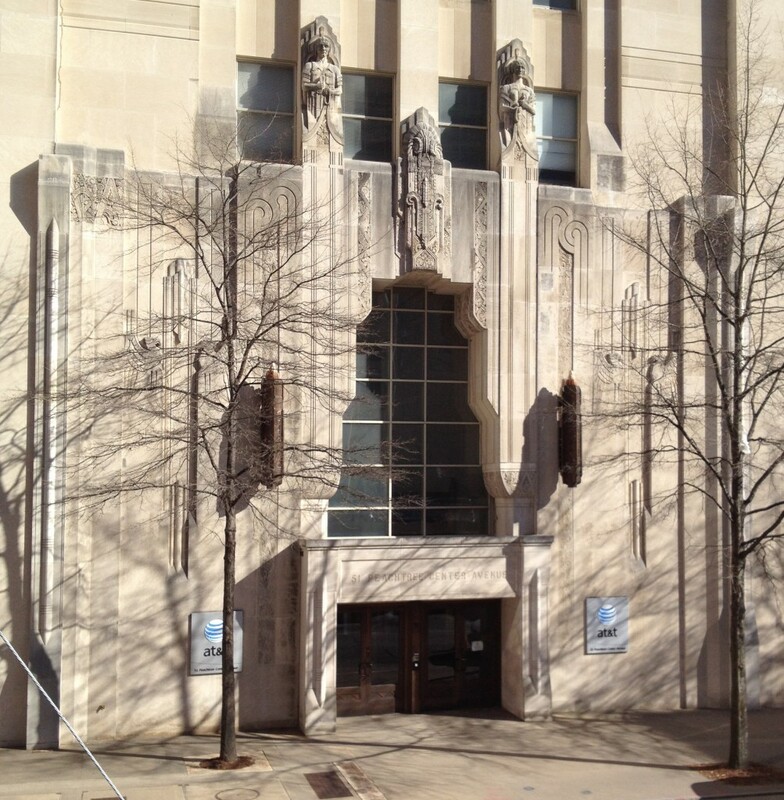 And underneath the limestone walls of this historic building lies a story that delves into Atlanta history, along with the history of telephones. While private individual telephone lines were in Atlanta as early as 1877, public telephone systems came to Atlanta in 1879 with the Bell Telephone Company’s Atlanta Telephonic Exchange. The Bell company was started in 1877 in Connecticut and operated under various names over the first fifty years of its history (the Bell Telephone Company, National Bell Telephone Company, American Bell Telephone Company and various versions of the current name, the American Telephone and Telegraph Company, aka AT&T). The first known Atlanta telephone line was a private connection between the Western & Atlantic Freight Depot and the Union Passenger Station installed in 1877. 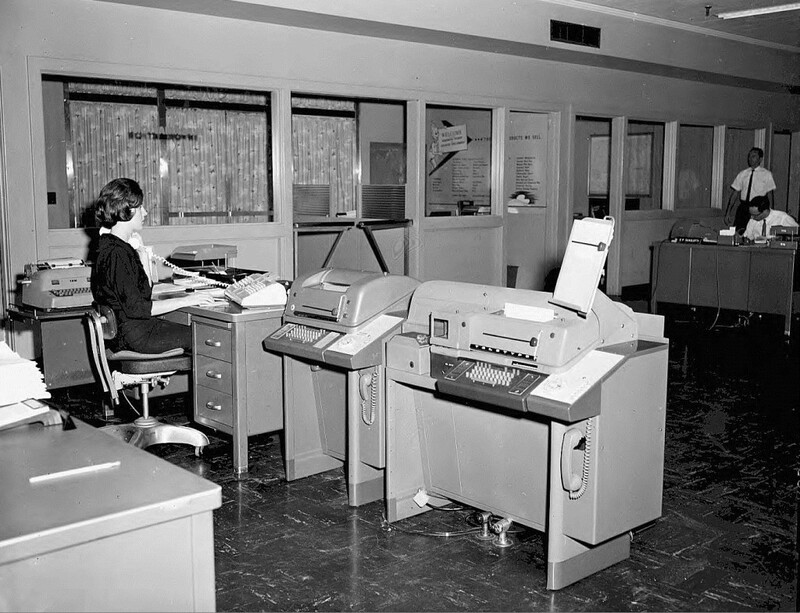 The first system for multiple telephone users was the Atlanta Telephonic Exchange (mentioned above). It was installed as the southern Bell Systems franchise in the Kimball House Hotel (pictured below) in 1879. The Atlanta Telephonic Exchange of 1879 occupied one room on the top floor of the hotel and originally serviced only a few dozen phone lines, many of them party lines (shared lines with multiple owners). The number of users gradually increased to incredible numbers over the years; by 1884 the number of telephone lines in Atlanta had increased to 370, and by 1910 the numbers had jumped into the thousands. Phone numbers were originally three digits; since many were party lines with multiple end users the telephone companies added letters to the end of the three digit phone number to distinguish which party line user your were calling (ex: 317-C), and the numbers increased as more people added telephones to their houses (ex: 3175-J). 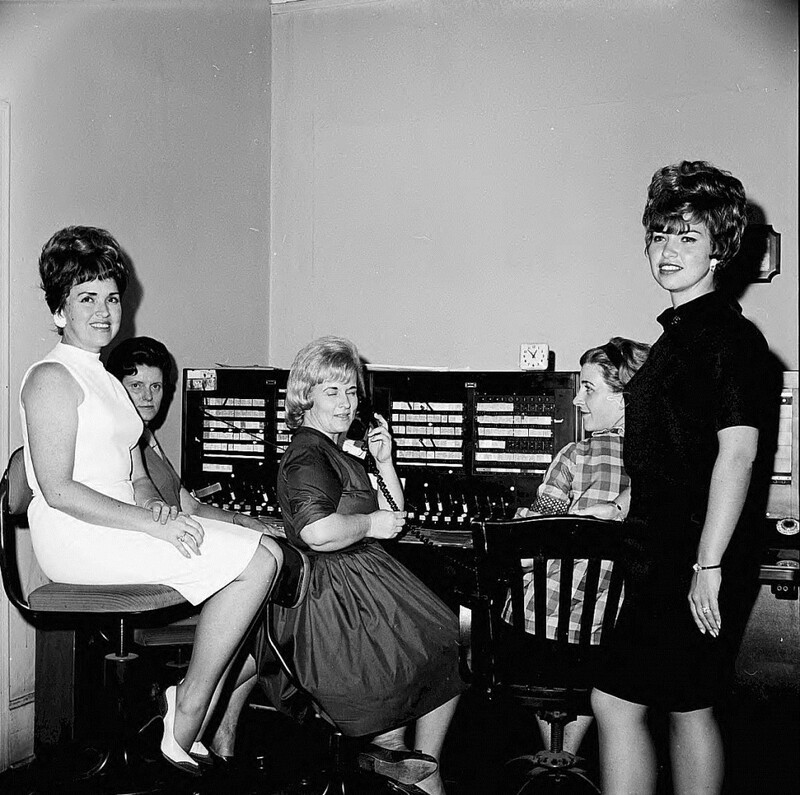 In the beginning callers connected to a switchboard operator, told them the phone line they wanted (and the letter, if it was a party line they were calling). Party lines were shared, so you didn’t have too much privacy if you were on one. People inside Atlanta seemed to have individual lines; the popularity of party lines increased as one moved out of the city into rural neighborhoods. Starting in 1882 the Atlanta Bell franchise became known as the Southern Bell Telephone and Telegraph Company. This company would grow into the Bell Operating Company servicing most of the American South, not just Georgia. At first in 1879 the two dozen phone lines were easily operated out of one room in the Kimball House. But as phone lines were added, Southern Bell slowly took over the entire top floor. 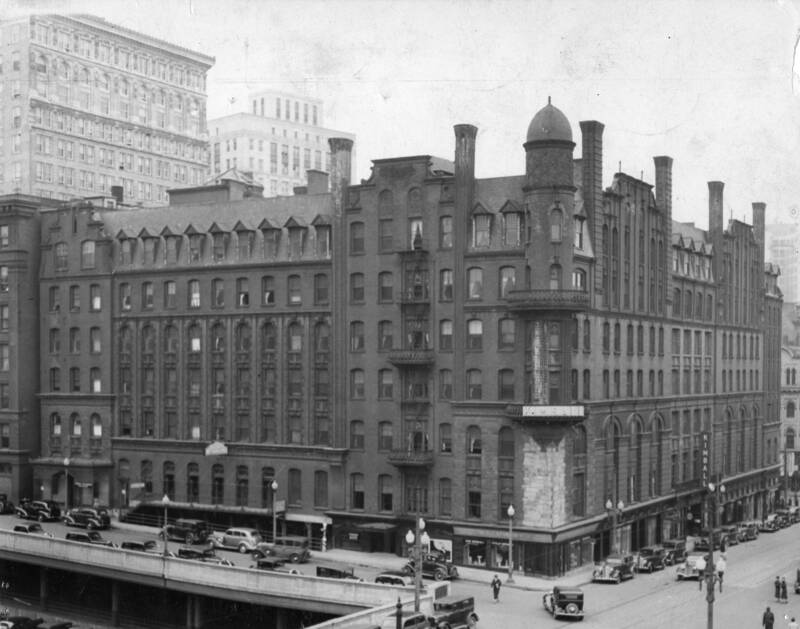 Needing space for offices and switchboards, Southern Bell constructed a new building in 1892 at 78 South Pryor Street, another new building at 56 Marietta Street in 1908, and yet another building at 25 Auburn Avenue in 1920. 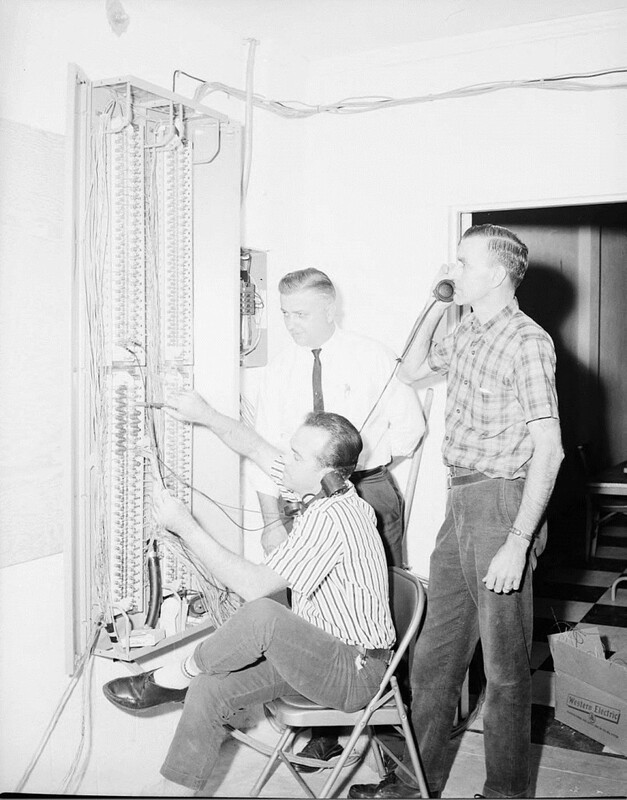 It illustrates the fast spread of telephone technology. Southern Bell operated various parts of the business (offices, operations, switchboards, etc.) out of these three buildings and others across Atlanta. Starting in the 1910’s Bell and other small private companies had been experimenting with semi-automatic panel switching systems. Bell always competed with private, local telephone providers; for a long time business ads in Atlanta listed two telephone numbers, one for the Bell line and the other for the local Atlanta company line. People in Atlanta had either Ma Bell or the local Atlanta telephone company; few people had both and the income level typically determined if your house had Bell or the local Atlanta service. And you couldn’t call out of your service; if you had Bell you could only call other Bell customers. Bell had always preferred to use human operators, but by 1919 it was clear panel and rotary systems were the way to go. This next step was a revolution in how the general Atlanta public used telephones. 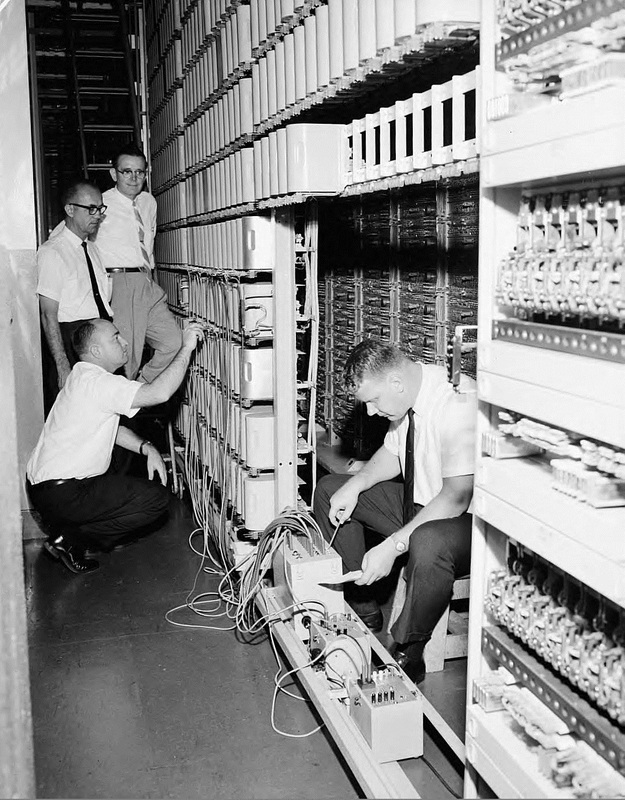 The first Bell Laboratories Panel Switching System was installed in 1921 in Omaha, Nebraska. The technology spread across the nation. This was the start of dial tones and each telephone user having to dial phone numbers and not rely on operators for local calls. Bell brought this new Panel Switching System to Atlanta on July 28th, 1923. Originally, telephone users in Atlanta in 1923 had to dial six digits, two for the area within Atlanta, and the remaining four for the individual they were trying to call. It proved popular despite the learning curve many telephone users experienced in the beginning, and by 1928 a second Panel Switching machine was brought by Bell to Atlanta. It was also during this year when Southern Bell decided it needed a larger, centralized home. 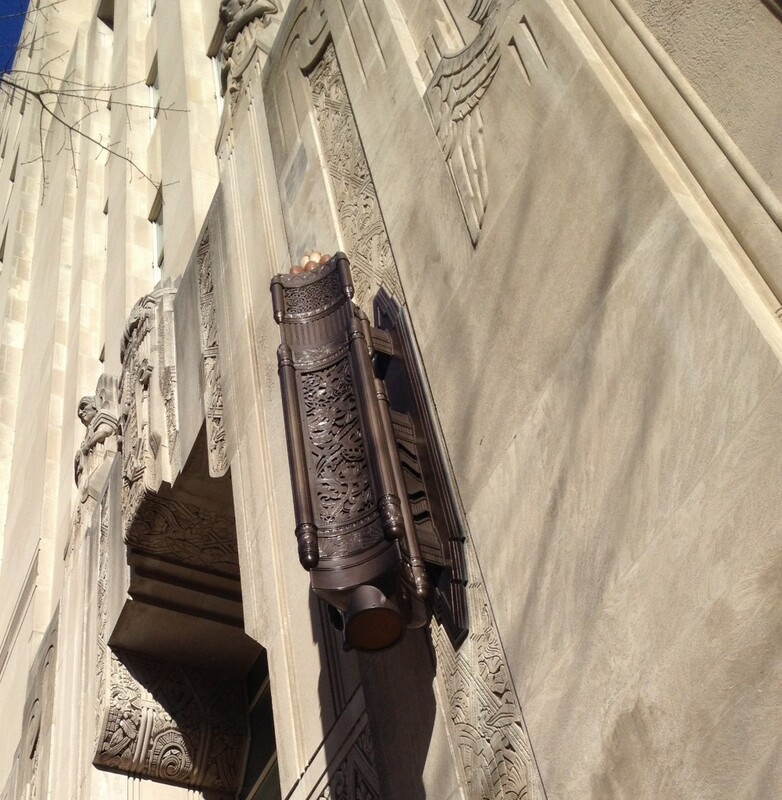 Southern Bell turned to the Atlanta architectural firm of Marye, Alger and Vinour, best known for creating the Fox Theatre, for the design of their new headquarters. When the design was complete, it was to be huge at 25 stories, making it the tallest structure in Georgia. But right from the start in 1928 Southern Bell approached the build in a piecemeal fashion. It was clear in the press they were planning to build only six stories of the 25 story structure (at an estimated cost of $1,000,000), and would complete the additional 19 stories in the near future. It was bad timing. 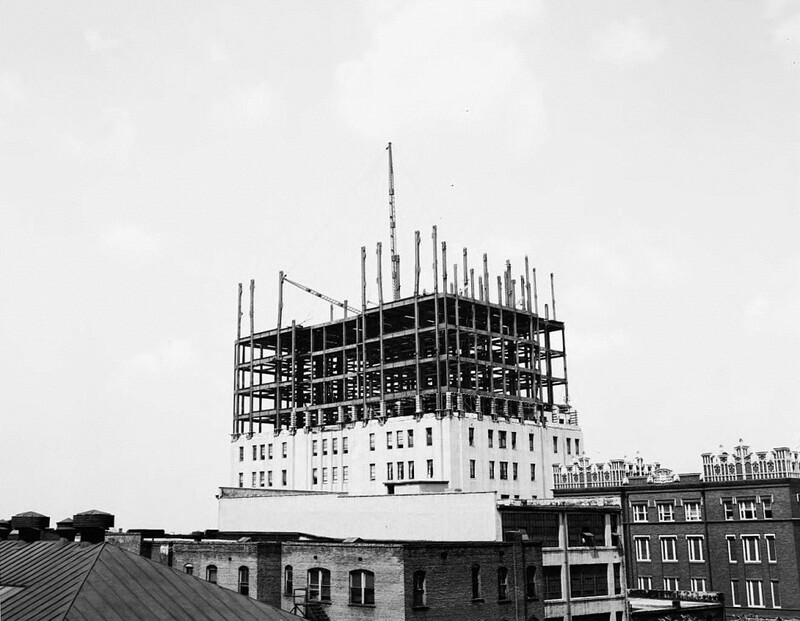 The cornerstone of the building that would initially be called 51 Ivy was laid on September 25th, 1929 (Peachtree Center Avenue was Ivy Street at the time, named for the settler Hardy Ivy mentioned above). Bad timing, because over the next few months the stock market would crash, consumers would stop spending and the whole world would descend into the dark depths of the Great Depression for the entire 1930’s. 51 Ivy Avenue, or the Southern Bell Telephone Company Building as it would become known, would never reach the heights envisioned by Marye, Alger and Vinour. It was expanded twice in the second half of the 1940’s to 14 stories total, but the building has always remained less than the 25 stories in the original design. 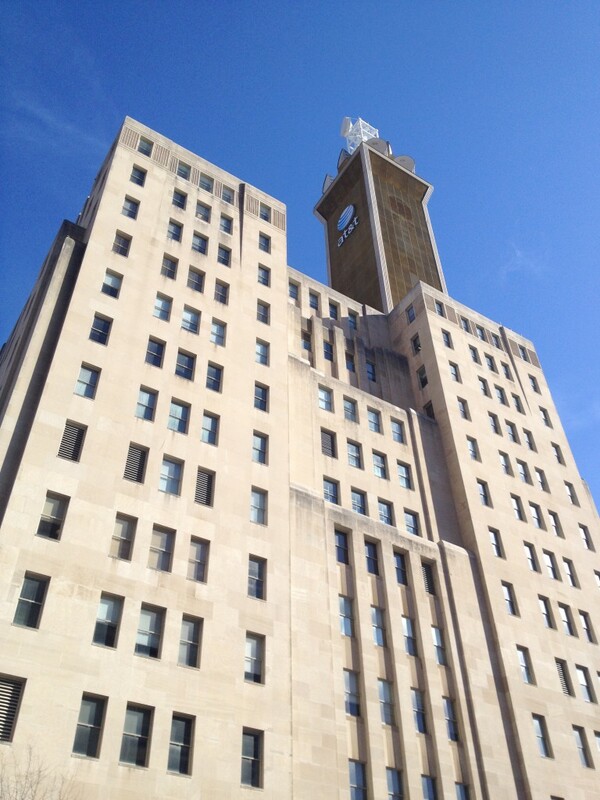 The big brown tower, called out by both architectural buffs and simple Atlanta skyline observers as being odd on a 1920’s Art Deco skyscraper, was added as a microwave broadcast station in 1963. Did You Know? The first Atlanta dial system offered two types of long distance phone calls: one, a “Short Haul”, which was a call within 30 miles of Atlanta (Decatur, etc. ); and two, a “Long Haul”, which was a call outside of 30 miles of Atlanta (Chicago, etc.). Long Hauls required an operator. Did You Know? Bell Systems (owned by AT&T) became a government-sanctioned monopoly in 1913. Did You Know? 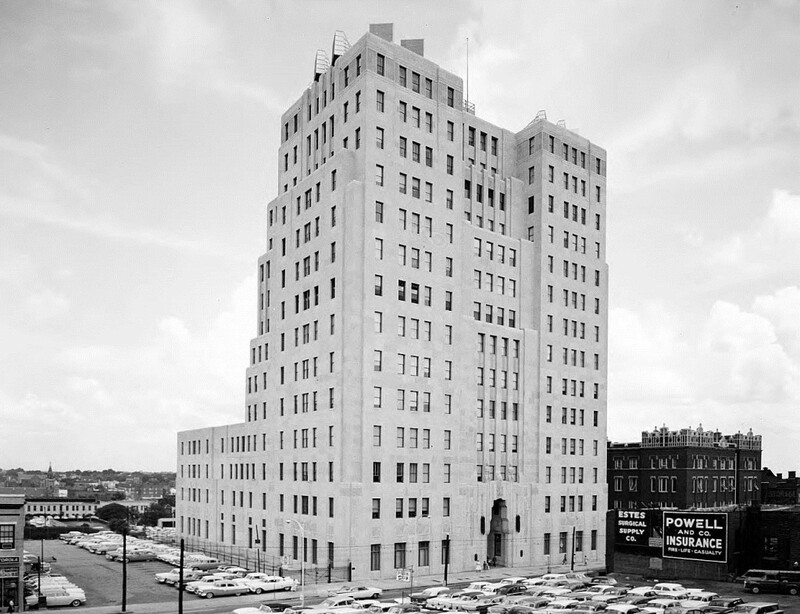 The Southern Bell Telephone Company Building, now the AT&T Communications Building, was added to the National Register of Historic Places on December 1st, 1978. @historyatlanta Hardy may be under the parking garage, but we know exactly where his wife is buried. Right here in Oakland! Even in 1973 when I made my one visit to 51 Ivy, security was extremely tight. I went in with one of our top computer and we went to a 1973 computer room where talking directory assistance was rocket science. Great article! One correction: the architectural firm was Marye, Alger and Vinour (not Vinou). It was Vinour that designed this building. Thanks Robert! Good catch. Yes it was Vinour that designed this building, not Vinou. I have updated the text! Thanks again!